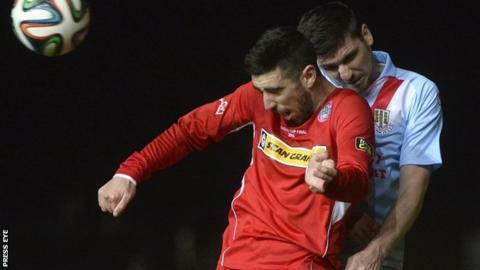 Ballymena United boss Glenn Ferguson is determined to overcome Cliftonville in Saturday's Irish Cup sixth-round clash. United were beaten finalists in 2014 while they will be out for revenge after suffering defeat by the Reds in last month's League Cup decider. "It doesn't get any tougher and obviously we were disappointed to lose the League Cup final," said Ferguson. "It's 110% time from the team - we know the strengths of Cliftonville and we just want to get into the next round." Cliftonville are going for a cup treble, with the 3-2 win over the Sky Blues coming 11 days after winning the Co Antrim Shield. However, the Reds have struggled in their defence of the Premiership title and manager Tommy Breslin believes improvement is required to secure a win at Solitude. There's coverage of all eight Irish Cup games on Saturday Sportsound, presented by Michael McNamee on Radio Ulster from 14:00 GMT. Bangor v Crusaders, Cliftonville v Ballymena Utd and H&W Welders v Glenavon are our feature games while there will be updates from the other sixth-round ties. The quarter-final draw will be made by John Devine and Gerard McMahon at 17:20. "We've been fortunate to get to two finals this year but we've no divine right to be in the hat on Saturday evening," he said. "Ballymena are a good side and they will come with renewed vigour, trying to emulate their achievement of last season in reaching the Irish Cup final. "We need to improve and get a more positive mindset for this match." Holders Glenavon visit H&W Welders in one of two early kick-offs - the other sees Portadown also facing Championship opposition, with Portstewart their opponents. Other potential upsets include Ballyclare Comrades hosting Dungannon Swifts and Armagh City at Glentoran. Carrick Rangers will fancy their chances against Premiership basement boys Institute at Taylors Avenue. It will be the battle of the leaders at Clandeboye Park with Championship pacesetters Bangor up against Premiership table-toppers Crusaders. Bangor are aiming for a double over the Crues after beating the Seaview side 2-1 in the Co Antrim Shield semi-finals in December. Linfield's game with Warrenpoint Town at Windsor Park will be played on Saturday as originally scheduled. The tie was put back to 16 February to allow an IFA investigation into whether Warrenpoint player Darren Forsyth was eligible to play in the fifth-round win over Coleraine. The IFA announced on Thursday that Forsyth had been eligible to play in the match, resulting in the Blues and Warrenpoint agreeing to stage the sixth-round clash two days later.